Recent studies highlight a growing class gap, in terms of prosperity and opportunity, between present-day Americans and the cohort that came of age in the 1950s. The root causes of this trend, however, have yet to be fully understood. In new research, I present systematic evidence confirming a growing class polarization in ‘social capital’ among American youth tracing back to the mid-1970s, and tie this trend explicitly to growth in economic inequality over that period. My usage of ‘social capital’ follows Robert Putnam’s emphasis on trust, civic engagement, religious involvement, and informal socializing. All of this leads, many claim, to economic growth, quality of democracy more generally, and support for redistribution. Moreover, both formal and informal social networks have been linked to elevated political participation. In summary, while it would be inappropriate to view social capital as a panacea for the ills of modern democracies, it is relevant to politics and society in interesting (albeit complex) ways. The argument that economic inequality decreases a society’s overall stock of social capital is not new. However, scholars have only recently turned to the question of whether inequality also polarizes people along class lines in terms of standard social capital indicators: level of engagement in ‘civic’ activities, volunteering, trust in other people, and so on. To find out, I use the Monitoring the Future (MtF) Survey series, a nationally-representative survey of roughly 16,000 high school seniors conducted by the University of Michigan’s Institute for Social Research every year since 1976. These are combined with contextual information about economic inequality – the ubiquitous ‘Gini index’ running from perfect equality (scored ‘0’) to perfect inequality (scored ‘1’) for each survey year. The pattern is both unmistakable and as expected. Figures 1 and 2 plot the average level of social capital on several common indicators against national-level Gini. Respondents are divided into three equally-sized groups according to parental education, which is the best available indicator of socio-economic ‘class’ in these data. 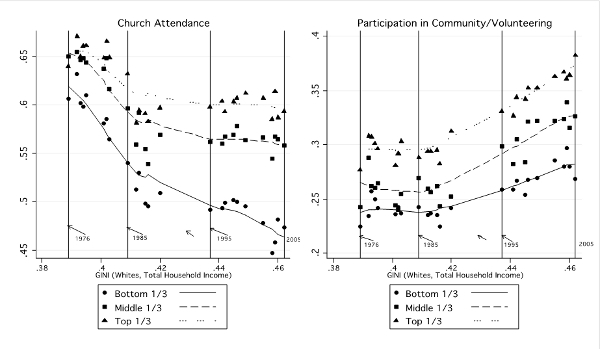 The increased vertical spread between these groups moving from left (most unequal) to right (most equal) indicates disproportionate social capital accruing to the better-off. Notes: Church Attendance is scored from 0 (“Never”) to 1 (“Once a week or more”). Participation is scored from 0 (“Never”) to 1 (“Almost every day”). Results are weighted by the provided sampling weights. Gini is yearly, nationwide measure scored from 0 (perfect equality) to 1 (perfect inequality). Source for survey data: Monitoring the Future 1976-2009. 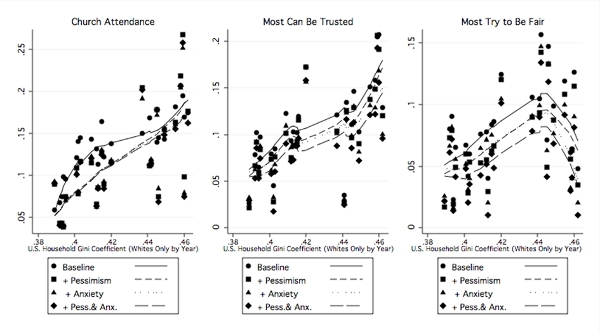 Notes: All three trust measures are scored from 0 “Least Trusting” to 1 “Most Trusting.” Results are weighted by the provided sampling weights. Gini is yearly, nationwide measure scored from 0 (perfect equality) to 1 (perfect inequality). Source for survey data: Monitoring the Future 1976-2009. The observed polarization might emerge in either of two distinct ways. The more straightforward of these is resource-based: civic engagement requires resources, broadly construed to include cognitive skills, time, money, and so on. So, as resource inequality increases, the cost of engagement becomes relatively higher for those at the lower end of the socio-economic scale than it is for their better-off peers. Alternatively, this polarization might emerge from more psychological processes: with increasing inequality, respondents of lower socio-economic status are pushed towards the margins of society, feeling alienated and less efficacious, and also less likely to be connected to society through personal networks. This fosters pessimism and powerlessness among the economically marginalized, sharpening “the psychological stress of life near the bottom of a steeply hierarchical society”. The concern here is less about resources per se ‘buying’ engagement, and more about how relative deprivation shape peoples’ expectations about society and their relationship to it. Notes: Estimator for all three outcomes is ordered probit regression. The “Baseline” model includes socio-demographic controls. “+Pessimism,” “+Anxiety,” and “+Pess. & Anx.” add the indicated variables to the models. Gini is yearly, nationwide measure scored from 0 (perfect equality) to 1 (perfect inequality). Source for survey data: Monitoring the Future 1976-2009. The two mechanisms are difficult to disentangle empirically, but evidence at hand suggests that the story is less ‘psychological’ in nature and more about out-and-out resources. One way to explore this question is to try to control for the psychological mechanisms in play and see if the baseline polarization noted above disappears. Figure 3 aims to do just this where data permits. On the x-axis we have inequality, while on the y-axis we have the strength of the relationship between class and social capital as estimated by multivariate regression. In this setup, the polarization from Figuress 1 and 2 is reflected in the upward-sloping lines (moving left to right). 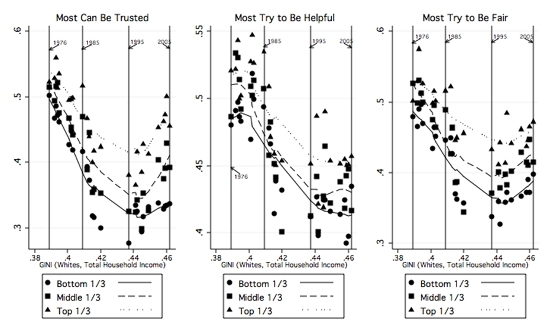 The critical point here is in how the lines change when information about how anxious and/or pessimistic survey respondents feel is added to the models: in short, they drop down vertically but do not flatten out relative to the baseline in any significant way, which shows that psychological forces (at least as measured) do not contribute to class polarization in any meaningful way. There is strong evidence that socio-economic inequality powerfully shapes social capital disparities between rich and poor. The obvious prescription is reduced inequality, or as Ric Uslaner puts it ‘don’t get rich, get equal’. That said, even if one accepts this there are many ways one might try to ‘get equal’, and we still know relatively little about what kinds of resource inequalities really matter. Better-off parents spend relatively more time with and resources on, their children, and could help drive the growing social capital disparities observed. Having relatively better-off parents also provides a more favorable institutional ‘opportunity structure’ in terms of school quality, extracurriculars, community-service opportunities, and even softer factors such as school pride and solidarity. Understanding whether and how these factors play into the relationship between inequality and social capital is necessary if progress is to be made. Matthew Wright is an Assistant Professor in the Department of Government in the School of Public Affairs at American University. 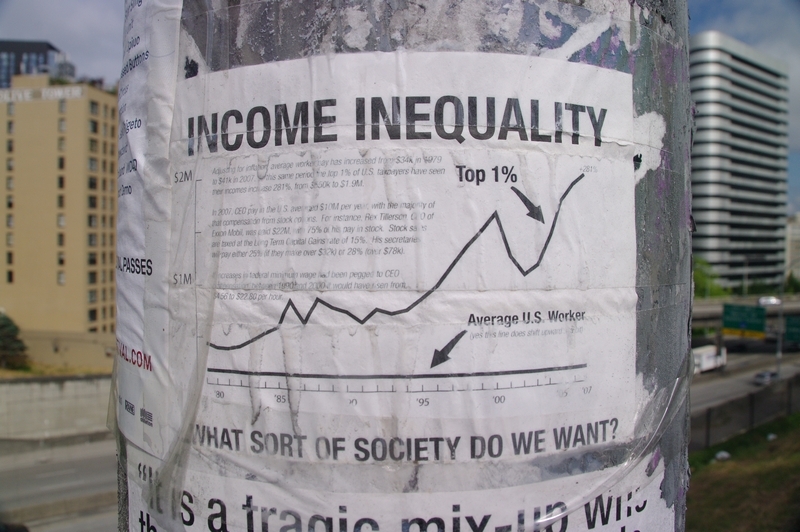 This article is based on the paper, ‘Economic Inequality and the Social Capital Gap in the United States across Time and Space’, in Political Studies. The research underpinning this blogpost was conducted during a one-year term as Legatum Institute Research Fellow with the Saguaro Seminar: Civic Engagement in America, John F. Kennedy School of Government, Harvard University, under Professor Robert D. Putnam. Support for the project was generously provided by the Spencer Foundation. It would not have been possible without the foundational but unpublished contributions of researchers at the Seminar preceding my involvement, particularly Rebekkah Crooks Horowitz, Josh Bolian and Robert D. Putnam. I also thank Michigan’s ISR for making available the MtF Panel data to us for analysis.